Giving back is very important to the Payne Family & Opti-mart. An organization close to our hearts is Southeastern Guide Dogs. This is a wonderful organization that creates healthier, stronger, more intelligent dogs that love people, love to learn, and live to please. There are several ways to be involved in this organization, and our favorite is to name these sweet animals. Since 1996 Opti-mart has named 8 dogs, totaling over $40,000 given to this organization. We choose the names to honor those close to us, including “JP” and “Rock” after our Founder John W. Payne and “Saint Jeanne” after his wife, both of whom have since passed away. Another way to support SEGD is to adopt a dog if it doesn’t make it through the rigorous training program. 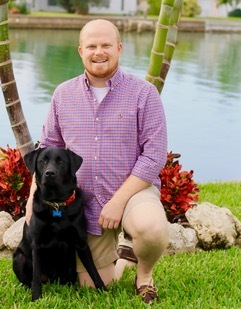 Pictured here is Tyler Payne – Opti-mart’s Director of Administration with his adopted dog “Rocky” from Southeastern Guide Dogs. Rocky has elbow dysplasia and was not able to continue on to be a guide dog but has now found his forever home with Tyler and the Payne family. Rocky is the sweetest and goofiest dog around. His favorite pastime is collecting as many toys as he can carry at one time while playing fetch around the house. We also have donation jars for Southeastern Guide Dogs in each of our stores. We are always happy to do any repairs or adjustments for our customers at no cost, we just ask for a small donation to SEGD! Scott Payne, one of our Owners was diagnosed with Parkinson’s in 2014, making this cause very close to our hearts. Each year our family & friends participate in the Parkinson’s Foundation Moving Day here in the Tampa Bay area. Our team name is “Pops’ Peeps” – after a nickname given to Scott by his kids. The money raised goes to fund research for Parkinson’s to ensure better treatment and better lives for those affected by Parkinson’s. Parkinson’s Disease can cause some vision changes. It is important to have regular eye exams and work with your Optometrist to monitor the health of your eyes. If needed, your Optometrist can refer you to an Opthamologist. Some vision changes that may be due to PD or PD medications include: double vision, dry eyes and decreased blinking, blurry vision, and trouble opening the eyes. Read more on the Parkinson’s Foundation website or ask your Optometrist. 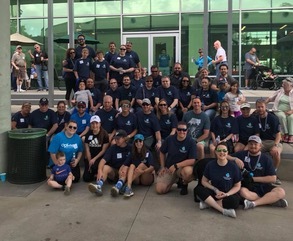 The Parkinson’s Foundation is a great organization and we are so glad we get to be a part of something that truly makes a difference for many in our community.